Disclosure: Brought to you by Mary Kay®. All opinions are my own. Well hello there, my makeup-loving friends! I'm so excited to share this makeup look with all of you today. For one, I got to play around with more products from Mary Kay® (who is the official beauty sponsor of Project Runway), and second, the look I created is absolutely perfect for summer! Mary Kay® Global Makeup Artist, Luis Casco, created two fabulous looks that were featured on Project Runway: the Sculpted Look (all about brows and lips) and Bronze Glow (all about eyes and cheeks). I got the chance to pick which look I wanted to try, and I immediately went for the Bronze Glow look! I chose Bronze Glow because it's effortless, perfect for hot summer days and easy for a mama of two. Who doesn't love a nice summer glow, right? The Sculpted Look is absolutely gorgeous--it's all about the brows and lips and is perfect for a night out on the town! You can check out more inspiration and videos on the Mary Kay® Project Runway page. Creating this effortless bronze glow look was so easy! The fact that it was super quick is a HUGE bonus! 1. I took the Powder Brush and Bronzing Powder and buffed it in to the areas of my face the sun would naturally hit: cheeks, forehead, bridge of nose and chin. I was very liberal with the amount I applied and quickly realized you cannot overdo it with this bronzer, which is great! It also has this slight sheen to it that creates the most beautiful sun kissed look. 2. I applied the Mineral Cheek Duo in Spiced Poppy (whoa look at that color!) very lightly with the Cheek Brush, using very minimal product and a patting motion. I always pat on my blush instead of swipe; I find it creates a more natural look and you avoid having such a harsh blush line. I applied this blush to only the apples of my cheeks. Can I just say this blush color is my new summer fave! This blush duo comes with a highlighter that I gently dabbed to the bridge of my nose and top of cheekbones for an even added sun kissed glow. 1. Using the Eye Color Brush, I applied Amber Glaze to my lids and crease, Precious Pink to my crease blending it in with Amber Glaze, and Gold coast as a highlight on the brow bone and tear duct. I also applied Amber Glaze to the bottom lash line to lend the bronze glow look all around the eyes. 2. I finished off my eye look with a very thin line of Jet Black Gel Eyeliner on the top lash line and two coats of Lash Love Lengthening Mascara. I love how this mascara lengthens my eyelashes without making them look bulky or feel heavy. 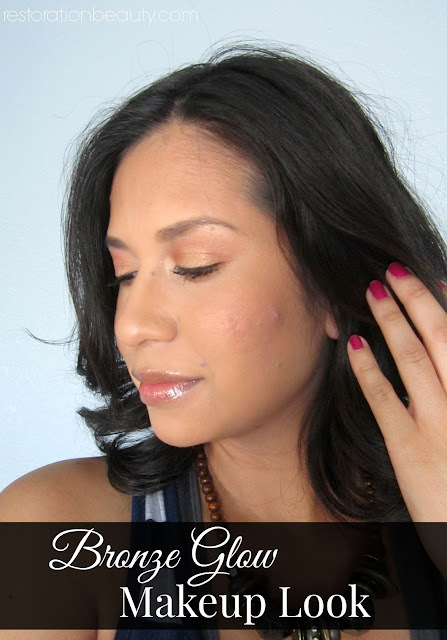 I applied the NouriShine Lip Gloss in Beach Bronze to complete my Bronze Glow look! This lip gloss has a gorgeous shimmer that catches the light just perfectly! My lips will definitely be rocking this lip gloss all summer! 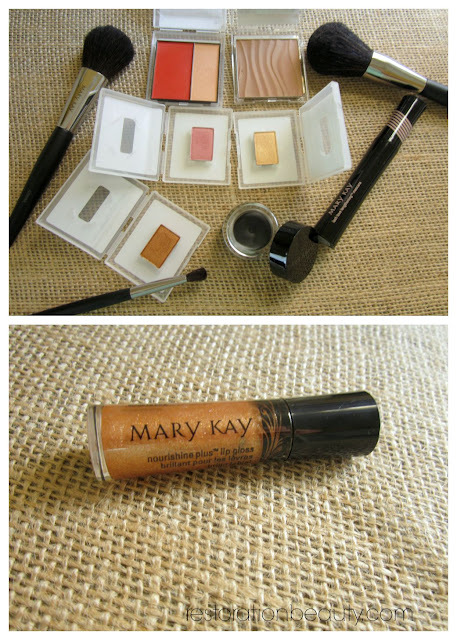 I had so much fun playing with these Mary Kay® makeup products and creating my rendition of the Bronze Glow makeup look! For more videos, ideas, and product information, feel free to visit the Mary Kay® website, follow them on Facebook, and watch their videos on YouTube! Sweepstakes time! Do you like the Bronze Glow? Or do you prefer the Sculpted Look? Leave me an answer in the comments for a chance to win a Mary Kay® prize pack! Oh man...I love that bronze glow look! 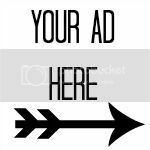 I bet you had a ball trying out new products! Makeup is so much fun to play around with and I love finding new things to try. :) Speaking of makeup, I have a question for you...do you use liner and mascara on your bottom lashes? I go back and forth with that one. I always line the upper lid, but I've been trying no liner on the bottom, and just doing the water line on the bottom, but I always end up feeling "naked" without at least a little liner on the bottom. Lol! I would like to try the sculpted look. Love the Bronze Glow look! I love the bronze look. 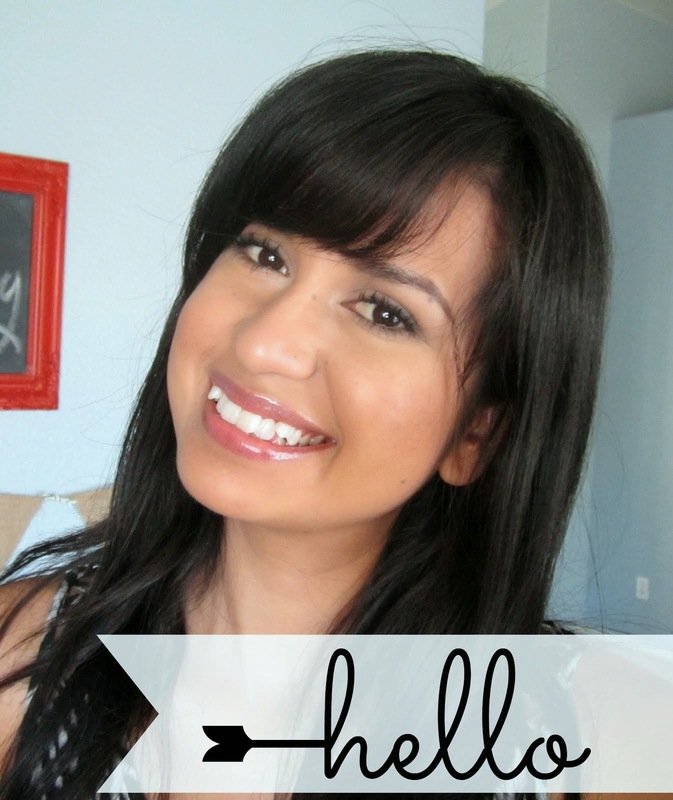 I prefer the sculpted look on me but the bronze glow looks great with your skin! I really like the Bronze glow in your pictures. I think it looks great on you! But, I like the Sculpted look as well. I like the bronze glow. I like the bronze glow look the best. Would really love to try the sculpted look. Love the bronzed glow look, so warm looking. The bronze look is my favorite to apply and I have got to try that gel eye liner it really looks all natural! I use the bronze look all year round! Gives a healthy glow! I love the bronze glow look. I've developed so many allergies to makeup I just don't want to invest in something I might have to discard so if I could win this to try it out it would be great. You look fantastic---you glow! I've never been able to get the hang of bronzer as I'm so fair but you make it look easy and I like that you find it hard to overdo it. Thanks!! I have Mary Kay makeup collection and this is my favorite shade. I love Mary Kay! I like the way you understand how amake helps to look attractive and stylish.Thanks for sharing with us. I just amazed to see this stuff, Its more informative. Thanks for share that. Jelly Gamat QNC, Umpan Ikan Mas, Jelly Gamat QnC, Umpan Ikan Lele, Jelly Gamat QNC, Ace Maxs, Jelly Gamat QnC, Aquatic Essen, Essen Ikan Mas. This website is really a walk-by way of for all of the information you wished about this and didn’t know who to ask. Glimpse right here, and also you’ll undoubtedly uncover it. My wife have this shade. I love it when she's wearing it. Keren artikelnya.. makasih kunjungi artikel saya jika ada masalah di wajah anda. Your work is very good and I appreciate you and hopping for some more informative posts. Thank you for sharing great information to us. Semoga informasinya membantu gan dan tunggu info selanjutnya dan salam sehat. 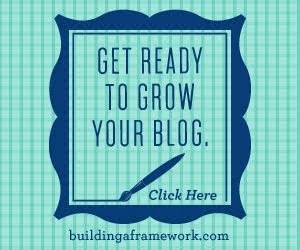 This is a smart blog. I mean it. You have so much knowledge about this issue, and so much passion. You also know how to make people rally behind it, obviously from the responses. Youve got a design here thats not too flashy, but makes a statement as big as what youre saying. Great job, indeed. LOVE how glowy and healthy this makes your skin look! Much obliged to you for some other educational web journal. Where else might I be able to get that kind of data written in such a perfect means? I have a mission that I'm a few seconds ago chipping away at, and I have been at the post for such data. Hi Guys, here on this site you will get most recent reports in regards to the KBC GBJJ 2018. In the event that you are awesome aficionados of Kaun Banega Crorepati and you will inspire opportunity to play KBC GBJJ Today Question and Answer. Here we have day by day transferred one KBC GBJJ Today's Question you can give your right answer and top off every expected detail to inspire opportunity to play KBC GBJJ Season 10. Very clean web site, appreciate it for this post. It's true that happiness when sharing small things but can be of great benefit to people including this article is very useful. It is generally trusted that numerous Halloween conventions began from Celtic gather celebrations that may have agnostic roots, especially the Gaelic celebration Samhain, and that this celebration was Christianized as Halloween. A few scholastics, in any case, bolster the view that Halloween started freely as an exclusively Christian occasion. We will always refer to the information that you present. This article contains a lot of information needed by the general public, so it is very interesting to read by anyone who needs that information. Hotstar is one of the TV channel as well as website which provide all data to their followers. All sports for example Cricket, Football, Hockey, Kabaddi & many sports are broadcast on this platform. In this Paragraph portray all Sports Broadcasting Rights in everywhere throughout the world occasion. PTV have expert to communicate every single Pakistani Sport occasions on the web with the goal that’s the reason People for the most part seek on Google PTV Sports Live TV. Hey, I like the way you write this post and the thing is I was looking for this content over the various site but I was not getting exact words or phrase which I was searching for but I found on your site, thanks and keep going on.